Clonbur in Ireland-West a perfect base for your holiday in County Mayo. Find out more about Clonbur below. This gorgeous stone cottage just 1 mile from Finny village and 7 miles from Clonbur and Ashford Castle. The lively town of Westport is a 30minute drive whilst Galway City is within 1 hour. Tastefully furnished, with open plan living space with all mod cons, comfortable bedrooms and a fabulous decking area overlooking Lough Mask - ideal for a barbecue in the evening to relax and take in the breathtaking views. Fishing is available from your doorstep. Fabulous hill walking area with the best restaurants and beaches in the country in nearby Westport, Cong and Clonbur.Shop 1 mile. Pub 2 miles. Restaurant 7 miles. Beach 2 miles. GF: lounge, lounge/kitchen/diner, utility room, sun room, double with ensuite shower room, twin, bathroom with separate shower. FF: king size double with additional single (interconnecting door to first floor bathroom), kingsize double with balcony, bathroom.Oil by meter read and electricity by meter read, wood burner with starter pack, linen and towels included, travel cot, high chair, stair gate, TV, dvd player, freezer, microwave, dishwasher, w/machine, hairdryer, alarm clock, welcome pack, fully enclosed garden, patio area, decked area, picnic bench, bbq, swings and slide, private off road parking, balcony. One small pet welcome. 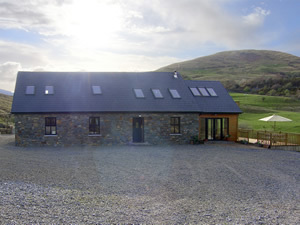 Clonbur is family friendly self catering. Clonbur is a great base to explore the wonders of County Mayo and you will find plenty of activities near by. Clonbur is at Connemara, County Mayo. Check out the map below for directions, use the controls to zoom in. Find Cottage Holidays works closely with independent cottage owners and leading holiday travel operators to provide you the widest choice of self catering accommodation across Ireland. Clonbur in County Mayo is available through: Imagine Ireland.